Tsb: obsolete notice: this bulletin is now obsolete. please see t-sb-0035-16. Tt: iphone text messages do not appear on multimedia dis[play. Tsb: some 2014 ? 2016 model year sienna vehicles may exhibit an intermittent cruise control stalk illumination flicker condition. please follow the repair procedure in this bulletin to address the condition. Tt: some vehicles may exhibit an error message when trying to perform a radio software update: "unable to update the software. please try again later." if the following screen is seen, follow the directions below. Tech tip: some customers may experience difficulty programming homelink. Tt: some customers may experience bluetooth connection issues after updating the android operating system to 5.x.x (lollipop) or later. Tt: for customer concerns of no or poor outgoing sound from the bluetooth systems there are diagnostics in the repair manual which can be performed to diagnose the condition. Tt: when updating either the navigation or radio firmware, verify the vehicle applicability before beginning the update. Tsb: obsolete notice: september 14, 2016: this bulletin is now obsolete. please see t-sb-0134-16. Tt: some vehicles may exhibit an error message when trying to perform a radio software update: "unable to update the software. please try again later." if the following screen is seen; follow the directions below. Tt: some vehicles may exhibit an error message when trying to perform a radio software update: ?unable to update the software. please try again later.? if the following screen is seen; follow the directions below. Tsb: the immobilizer and smart key reset is a feature that allows the registration of new keys when all master keys are lost. once the system is reset, all previously registered keys will be erased. This publication discusses how to find the diagnostic information and component exchange information for the southeast toyota accessory overhead dvd player. Tt: iphone text messages do not appear on multimedia display. Tt: clock becomes inoperative, has dashes displayed, or cannot be adjusted. Tsb: the procedure in this bulletin is a general guideline on how to properly diagnose the air conditioning system after a component failure. refer to the applicable repair manual for vehicle specific repair procedures and parts. Tsb: some 2014 ¿ 2016 model year sienna vehicles may exhibit an intermittent cruise control stalk illumination flicker condition. please follow the repair procedure in this bulletin to address the condition. Tsb: some 2014 model year applicable vehicles equipped with entune¿ audio (version 010169) / entune¿ audio plus (version 010171) / entune¿ premium audio (version 010185) may exhibit one or more of the following conditions. Tt: sliding door will not latch manually in the closed position due to either the front and or/rear lock malfunctioning. please see link references of video for example condition. Tsb: obsolete notice december 2, 2015: this bulletin is now obsolete. please see t-sb-0118-15. Tt: some 2015-2017 my sienna vehicles? front door glass run could be pulling out of the upper b-pillar corner while operating the window. Tech tip: tips for writing a dpr (dealer product report) on manufacturing issues for windows and windshields. Dealer daily message: extension of warranty coverage for the sliding door front lock assemblies. the dealer letter for warranty enhancement program zh4 is now available on tis. Dealer daily message: extension of warranty coverage for the power sliding door rear lock assemblies. the dealer letter for warranty enhancement program zh5 is now available on tis. Tt: previously, an error message was received when performing dcm activation initiated by techstream. this condition has been remedied, and dcm activation utilizing techstream can now be resumed. Tt: sliding door will not latch in the closed position due to either front and/or rear lock malfunctioning. please see link references of video for example condition and diagnosis instruction. Tsb: december 2, 2015: this bulletin is now obsolete. please see t-sb-0118-15. Tsb: some 2014 - 2016 sienna vehicles may exhibit an intermittent cruise control stalk illumination flicker condition. please follow the repair procedure in this bulletin to address this condition. 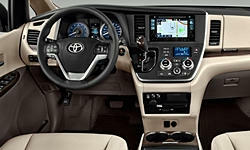 Toyota: some vehicles need updated clearance warning computer to resolve parking assist customize settings that will not be changed through display of radio. 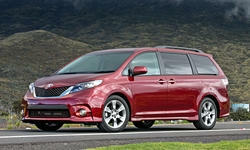 model 2015 sienna.